Volkswagen was an early pioneer in minivans with its Microbus, which dates back to the late 1950s. 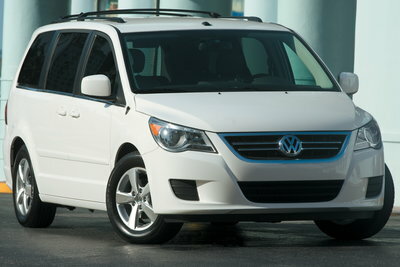 However, the contemporary American minivan market has never had an entry from VW. Now the Routan, built by Chrysler, finally gives VW customers a mainstream minivan. VW tuned the suspension and steering for a more European feel. Restyled front and rear fascias and an exclusive interior design ensure that the Routan is instantly recognizable as a Volkswagen. The Routan offers second row captain's chairs and almost 33 cu. ft. of cargo space behind the third row. Powertrain options include a 197-bhp 3.8L V-6 or a 251-bhp 4.0L V-6 mated to a 6-speed automatic. Traction control and ESP (Electronic Stability Program) are standard. Available options include a rear seat entertainment system with dual 9-inch video displays, navigation system, and a power liftgate.